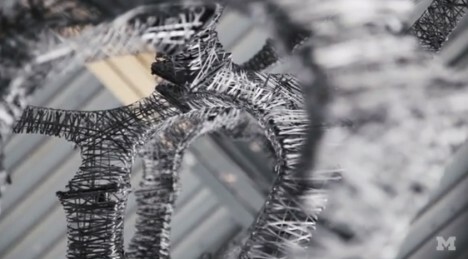 The buildings of the future might just look as lightweight as a spiderweb, seeming as if they could blow away at any moment, while actually being incredibly strong. In the past, architects had to choose between delicate looks and durability, but the development of new composite materials unveils all sorts of possibilities. 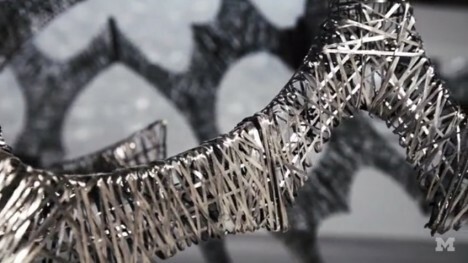 The c-LITH research project demonstrates the strength of digitally fabricated carbon fiber filaments stacked in small sections. The team created a prototype that’s 14 feet tall and 8 feet wide at the base, yet uses only 30 pounds of material. 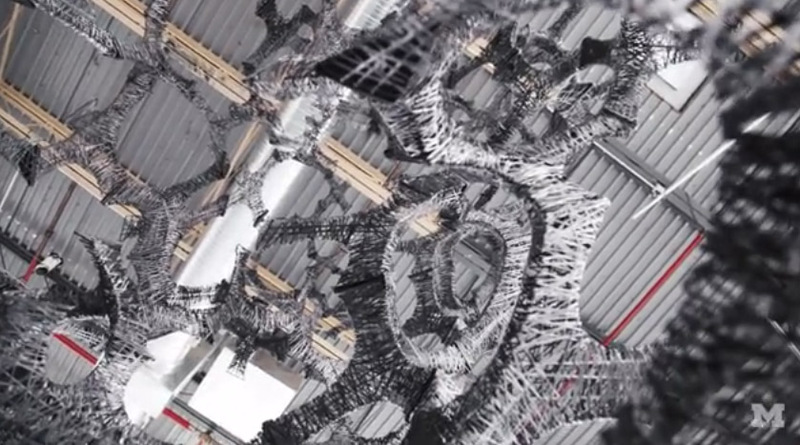 It’s made of 143 wound carbon fiber filament ‘bricks’ that can be scaled up for architectural production. 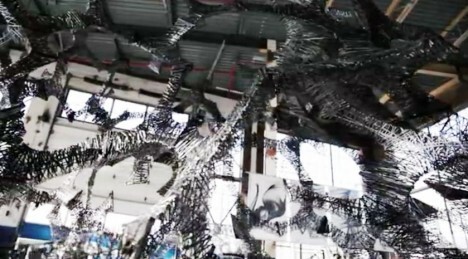 The use of carbon fiber has been fairly limited in architecture, as it usually comes in panels like those used for airplanes, and isn’t exactly cost-effective. 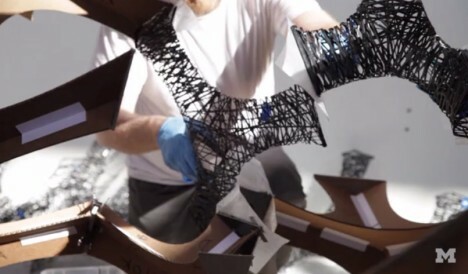 Michigan-based architecture firm Area used inexpensive cardboard molds to create the sections using carbon fiber filament pre-pregnated with epoxy resin to keep it malleable until baked. They built their own low-heat oven to cure the sections at 260 to keep the cardboard from catching fire. Once finished, the pieces were soaked in water so the cardboard could be removed. The resulting bricks are stacked into a tetrahedral geometric shape, and pins connect the components, making them easy to assemble and disassemble. The designers see the possibilities as virtually endless, and it’s fun to imagine what could be made with this material at a larger scale.